There are several benefits to having in home music lessons Winnipeg. 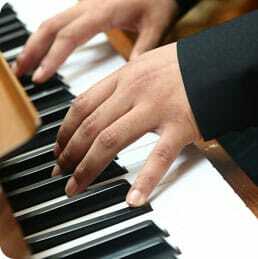 For students taking keyboard lessons Winnipeg there is the advantage of having the instruction on their own instrument. Every piano and keyboard has its own unique sound and feel. For electric pianos, some have weighted keys, some semi weighted and some with no weighting at all like a keyboard or organ. It can be very difficult and frustrating for students who practice at home all week to have their lesson on another instrument that sounds and feels differently. This is the same with drum students. It is very nice to have lessons on your own drum kit. For students taking guitar lessons or even violin lessons there is no need to travel with your instrument when the lessons are in home. We have found that students are more relaxed and less nervous having their lesson at home in familiar and comfortable surroundings. The result is fewer mistakes, better performance, more confidence and a more successful overall experience. Additionally, parents can listen to the lesson from a distance without feeling that they are intruding. Another great advantage of in home instruction is that students are able to practice right before and after their lesson. They are able to warm up and have the music fresh in their minds and fingers. It is also quite advantageous to practice right after the lesson while it is still fresh in the student’s mind. This will help the student to remember important information that the teacher is trying to convey during the lesson. Lastly, one of the main reasons families choose to have singing lessons Winnipeg is the convenience. Families are often busy with many commitments and activities. It can be difficult to manage time. Having vocal lessons Winnipeg is the ideal solution to save traveling and waiting time.